Can guinea pigs drink water from a bowl? We know that guinea pigs can drink water and drink it often. They live to drink water and it is the only liquid that they can really drink. The most common way do feeding guinea pigs is to give them tweet fro a bottle. But what if you dint have a water bottle, can Guinea pigs drink water from a bowl instead? Water is fine for them to drink from a bowl. However the thing is with using a bowl for guinea pigs to drink from is that guinea pigs will very easily step in it, pee in it, excrete in it and anything else they fancy doing in it. In fact, they don’t really care if they do. So giving guinea pigs water from a bowl is not as good an option as giving them water from a bottle but still enables them to be fed water without a bottle. However, the water in the bowl does nee do be changed very often to make sure that any contaminants are removed and that the bowl is refreshed properly. Once they are refreshed properly then they can be given to guinea pigs again. Having a thirsty guinea pig is never a good thing! If you want your guinea pig to be healthy and lively then a good supply of water is vital to ensure that they live a long life and you don’t end up killing it off earlier than their natural life intended. Although guinea pigs get water from the foods they eat in their diet, they still need to be provided with water to ensure they get what they need to quench their thirst and to ensure that they don’t starve. The usual way to ensure that your guinea pig gets the water they need is to use a water bottle which can be bought from any pet store and attach it to the cage. Glass bottles tend to be much easier to clean than plastic bottles. Another good thing to purchase is a bottle brush so as to clean the inside of the bottle. Can guinea pigs drink from a bowl? You can also use a water bowl that can be placed in the cage that the guinea pig can take water from. There is nothing wrong with doing this although there is a danger that the guinea pig may poo or pee into the water which is why a water bottle is the more preferable way of giving water to your guinea pig. Which ever method you use, make sure that you refresh the water supply to your guinea pig on a daily basis. How much water should I feed my guinea pig? It is never a good idea to limit they amount of water your guinea pig drinks as they do need water to survive. Give them as much as they need. However, do keep an eye on how much you are feeding your guinea pig. What if my guinea pig is not drinking water? If you are concerned about how much water your guinea pig is drinking then do keep a record of how much you are giving your guinea pig on a daily basis and if necessary consult your veterinarian. Supplement their diet with foods that are high in water value such as grass, cucumber and lettuce. This will give their water intake a boost. Another thing to look at is whether you have a leaking water bottle as well. What types of water can I give my guinea pig? 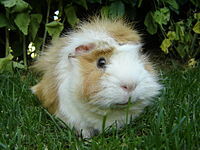 Normal tap water is sufficient to be used for guinea pigs. Do not attempt to use any other types of flavoured water or sugar water as this wont be appreciated by the guinea pig and may harm them. How often should I clean my water bottle? Try and clean the water bottle at least every two or three days, using your bottle brush and some vinegar clean out the bottle before rinsing well with water. Once you are happy that it has been rinsed well, fill the bottle up again with fresh water and put the cap on before placing it back on the cage. In order to protect the bottle from algae, then a protective cover will help prevent the sun’s rays getting to the water bottle. Another consideration to make is that if you keep your guinea pig outside during winter time, then make sure that you keep the water bottle insulated as well. You can purchase water bottle covers that keep a guinea pig’s water bottle well insulated so that it doesn’t freeze up during winter. A frozen water bottle is a sure way of killing off a cavy, so its a good investment.